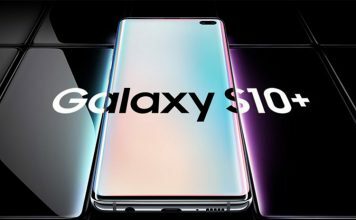 When the Korean Smartphone giant announced its next flagship device Galaxy S6 — with a variant named Galaxy S6 Edge —, at MWC 2015, one of the major factors to attract attention was the Smartphone’s stern build. 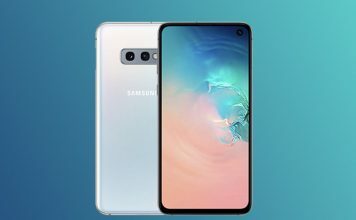 Now, having extended availability to several countries and the unlocked version being available for pre-order costing around $765 at Amazon, some of you might be planning to get the Android Lollipop-running Samsung Galaxy S6. Well, in spite of the stern build of device, the rough Smartphone user may need additional protection — from drops, rain, snow and other accidental damages! And, the most dependable option is to have a covering-all Samsung Galaxy S6 case that can protect your device from accidents that you do not expect. In this post, we have taken an effort for creating a list of best 15 Samsung Galaxy S6 cases — hope it helps. 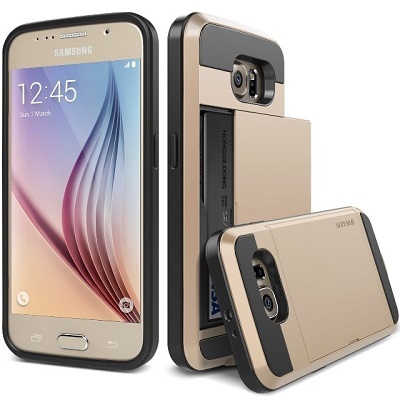 OtterBox Commuter Series Samsung Galaxy S6 Case is an all-rounder protective case for Samsung Galaxy S6, given its capability to protect your Smartphone from drops, scratches, dust etc. Despite being conveniently slim, the shell that is made of polycarbonate offers a superb two-layer protection. Noticeable features of this on-the-go protective case include an adhesive screen protector, interior slipcover cushions, exterior slipcover made of synthetic rubber etc. 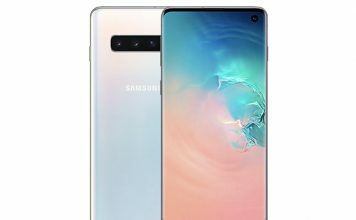 So, if you need a combined protection for both device and screen, this is a sense-making choice. When you would like to spend a mediocre amount of money to have an all-round protector for your Galaxy S6, you’d love to check out Spigen Neo Hybrid Series Samsung Galaxy S6 Case, which combines a TPU Case and polycarbonate bumper, along with a raised lip for the sake of screen protection. Features we loved in this case include use of metal-coated button protection, rubberized grip to enhance handling and a comparatively slimmer design. However, the case does not offer screen protection. 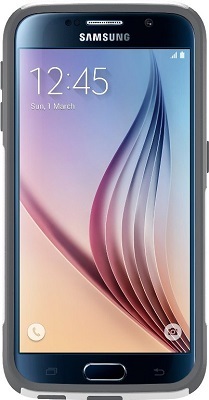 Aimed at those ultimate rough users, OtterBox Defender Series Samsung Galaxy S6 Case offers an impressive level of protection with three layers — the polycarbonate shell, exterior slipcover cushions and built-in screen protector. So, the case will protect your S6 from drops (even serious ones), dust, scratches and all, even while giving a premium & sturdy look to the Smartphone. 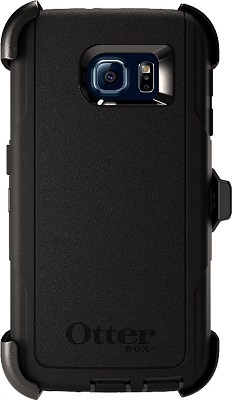 Though slim in design, OtterBox Defender Series Samsung Galaxy S6 Case can give a truly rugged level of protection. Manufactured with a single-piece design in mind, Speck CandyShelll Case for Samsung Galaxy S6 is a convenient and productive choice when you need double-layer protection for your S6. The hard-shell exterior guard protects device from drops and scratches while the soft rubberized interior design is meant for the protection from bumps and all. In addition, rubberized shields are used for covering power and volume buttons as well. 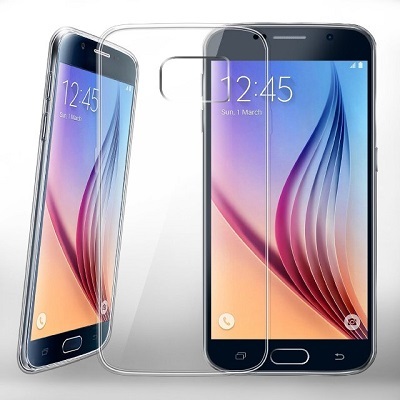 Apart from these, raised bezel of Speck CandyShelll Case for Samsung Galaxy S6 is useful in protecting the screen. Maxboost Samsung Galaxy S6 Case is a yet-to-be-available protective case for your S6; if you expect your S6 to reach you by first week of May, you can order this case now. Being a product of Maxboost Vibrance series, the case has the availability in vibrant colours, but it does not compromise quality of protection. 360 Degree protection is available; it protects your S6 from drops and scratches. In addition to features like soft interior and perfect cut-outs, Maxboost is offering lifetime warranty as well. 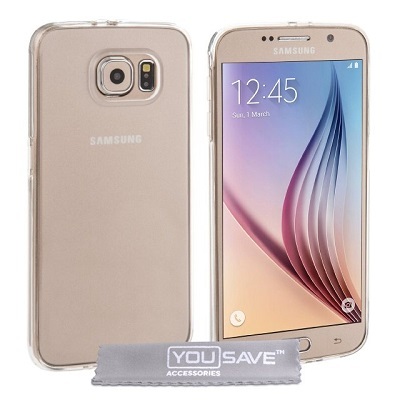 Yousave Accessories Samsung Galaxy S6 Case is one of the cases that have blended high-class protection of device & minimalistic design concepts. 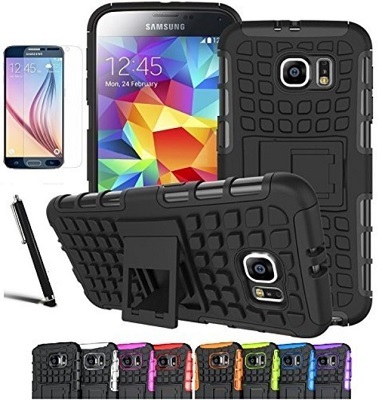 Thus, in the long run, you get a TPU-made case with in-built protection of Smartphone screen of your Galaxy S6. Being exclusively made for S6, Yousave Accessories Samsung Galaxy S6 Case comes with all the required cut-outs, getting you out of those it-doesn’t-fit messes. And, yes, it’s damn affordable, we’d say. Do you want to remove your wallet from your pocket and store your credits cards or other stuff with your S6? If so, it is worth check out Yousave Accessories Leather Wallet Cover Galaxy S6 Case, which combines a wallet & a protective case. However, talking of the protective features, Yousave Accessories Leather Wallet Cover Galaxy S6 Case includes a lot such as the clear screen guard, leather covering, magnet-based closure of wallet etc. 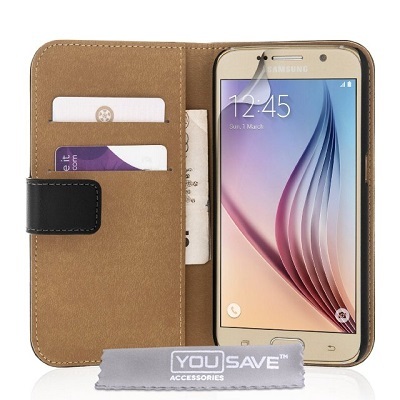 So, in our opinion, Yousave Accessories Leather Wallet Cover Galaxy S6 Case is a steal deal. 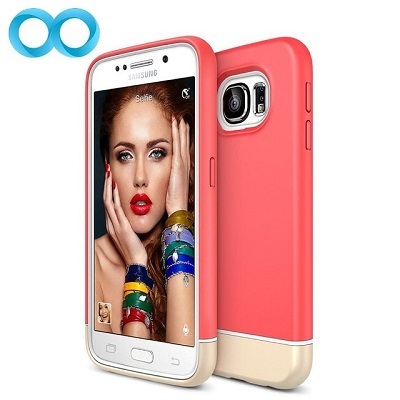 Ionic BELLA Case for Samsung Galaxy S6 is a dual-layer protective case for YOUR S6, combining a soft layer and hard surface to give all-round protection. Even then, Ionic BELLA Case for Samsung Galaxy S6 does not affect looks & style of your S6, with its clever use of colour combinations and all. Also, the hard surface includes extra grip as to protect the device from accidental drops. 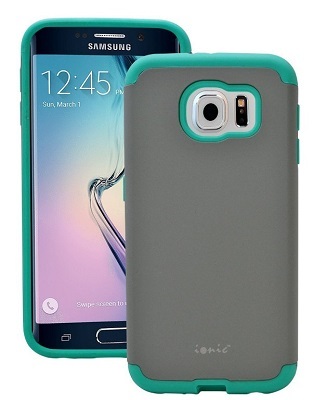 Altogether, especially after considering the price, Ionic BELLA Case for Galaxy S6 is worth buying. If you prefer rugged level protection for your Smartphone when giving the device rather a majestic look, Spigen Ultra Rugged Galaxy S6 Case is a good choice, we’d say. 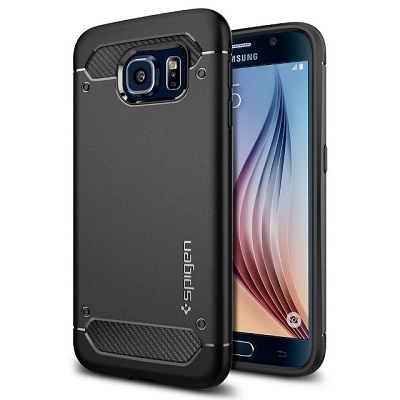 In addition to the TPU-case that consists of raised lip and interior protection, the Air Cushion Technology of Spigen Ultra Rugged Galaxy S6 Case protects your device from drops and bumps. When we take its price into account, Spigen Ultra Rugged Galaxy S6 Case is a good-to-go deal for those who seek rugged protection. 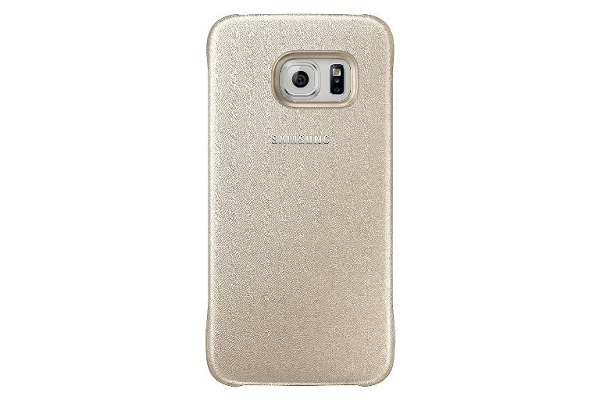 Here we have our player from the brand itself — Samsung Protective Cover for Galaxy S6. 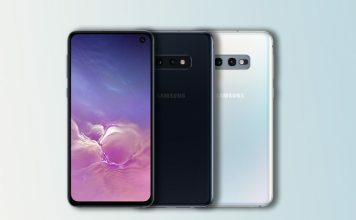 Since it is a product from Samsung itself, you can be sure that it fits well and does the job very well when it comes to providing all-in-one level of protection for your Smartphone. 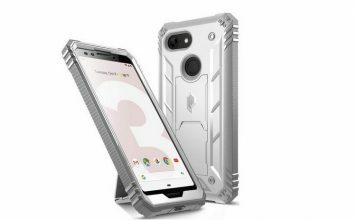 It has to be noted that, as the manufacturer itself mentions, the case is meant to offer basic protection and thus to interfere less with the design elements of the device. So, if that revelation doesn’t affect you, go for Samsung Protective Cover for Galaxy S6. If you need a powerful protective case that does not, in any way, affect looks of your S6, you should check out Fintie Hybrid Protective Case for Galaxy S6, which combines a transparent protection that does not compromise protective features. In addition, Fintie Hybrid Protective Case for Galaxy S6 has raised bezel, meant for screen protection when placed face-down. With respect to the price, this TPU-made protective case is awesome. 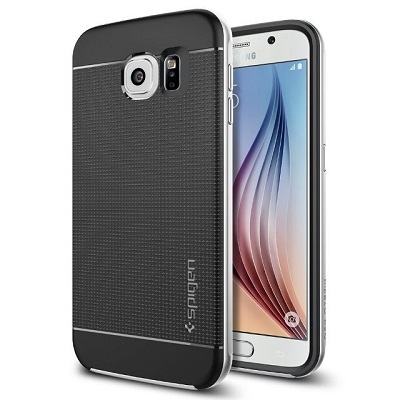 To be available on the same date of Samsung Galaxy S6, Caseology True Grip Samsung Galaxy S6 Case is a TPU-made protective case for Samsung Galaxy S6 that prioritizes grip and handling above all. Along with complete compatibility with Samsung Galaxy S6, the case from Caseology offers a number of color choices to choose from. 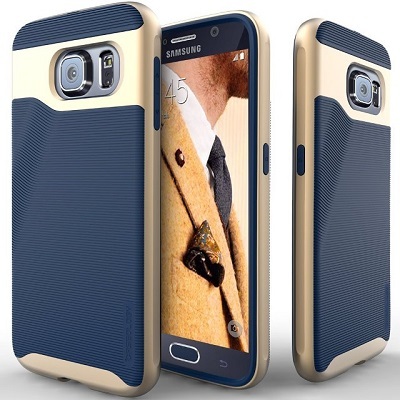 Coming to case of features, Caseology True Grip Samsung Galaxy S6 Case has raised lip, lifted bezel and easy-to-push buttons etc. If you need dual-layer protection for your Smartphone, along with some productive stuff, CINEYO Rugged Dual Layer Case for Galaxy S6 is a worth-checking protective case for your Galaxy S6. Along with an in-built kickstand that helps you view videos and photos better, CINEYO Rugged Dual Layer Case for Galaxy S6 includes required cut-outs, a free screen protector, raised lip etc. Altogether, level of protection is rugged, indeed. Obliq Ultra Slim Fit Samsung Galaxy S6 Case offers all-round protection features for your Galaxy S6, when giving it an awesome Titanium look. When the matte surface protects the device from accidental drops by ensuring its grip, the dual-layer protective design uses polycarbonate shell and metalized black plate. Despite covering 360 Degrees of the device, Obliq Ultra Slim Fit Samsung Galaxy S6 Case has left sufficient space for connecting cables and other stuff. In addition to all these, the case gives a superb feel when we hold it. With a huge collection of colors to choose from, Verus Galaxy S6 Case will impress the protective cover seeker! The most noticeable addition of the protective case is that it offers space to store up to two Credits Cards and IDs, meant to help you get rid of the wallet in some cases, at least. In addition, Verus Galaxy S6 Case offers rubberized edges, an impressive sliding technology etc. Altogether, we think Verus Galaxy S6 Case deserves place in the list — though last, not the least! 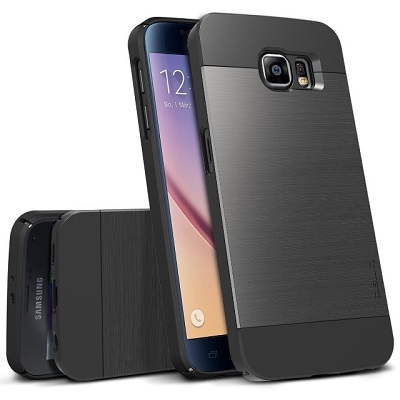 By the way, we are eager to know which protective case you are going to buy for your Samsung Galaxy S6?